Make this Quick & Easy Spring Wreath in Under 15 Minutes! Looking for a spring wreath idea that won’t break the bank – or send you into craft fail territory? 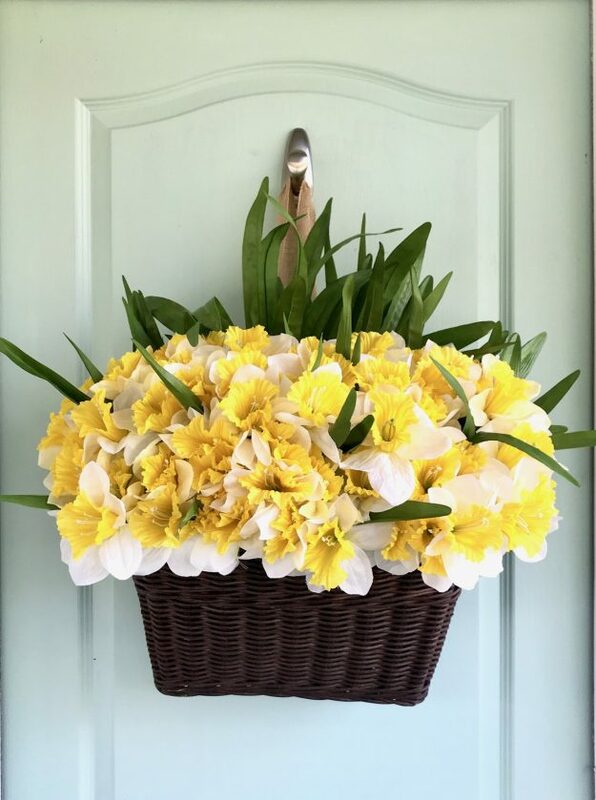 Then this bicycle basket inspired spring wreath is the perfect way to go. See, I consider myself a lazy wreath maker… it can’t be too complicated or I’m just not gonna do it. But this one is easy peasy! Y’all – this couldn’t be any easier. The hardest part was literally cutting down a huge cube of floral foam. Don’t buy the massive cubes that are all one piece – buy a couple of smaller pieces instead (and thank me later!) 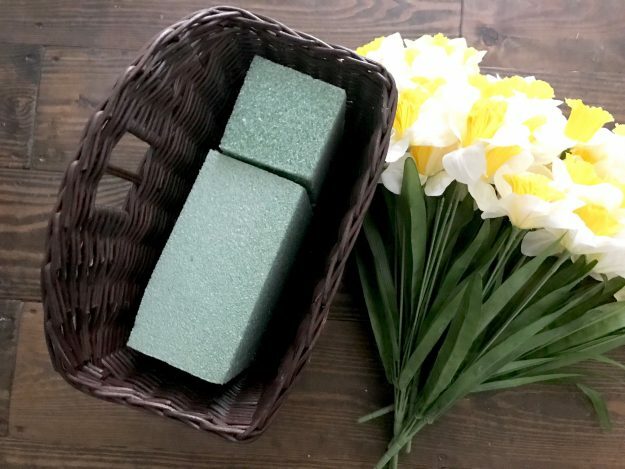 Fill the bottom of the basket with foam. Also, cut your flowers away from the bunch so you have individual stems. Don’t throw out that greenery, though! Tip: I found that leaving some stems longer and others shorter helped in placement. 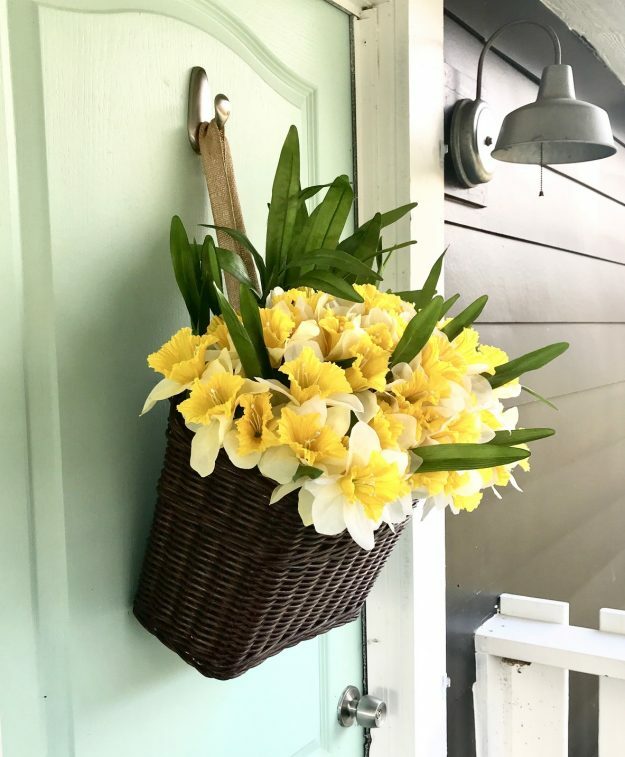 Once the arrangement is done, loop a piece of ribbon through the basket, then hang on your front door. The whole spring wreath literally took minutes to put together – and not a single hot glue gun burn in sight! Looking for more spring project ideas? I’ve invited a few of my friends to join me in celebrating a little warmer weather with their own beautiful DIY ideas! Gina, this is so cute! I need to replace my wreath soon because the birds keep stealing from it. Love this idea! Oh my gosh that is too funny Emy! Loving the daffodils! Very cute and very easy to make! We usually get birds nesting in our wreaths around here. 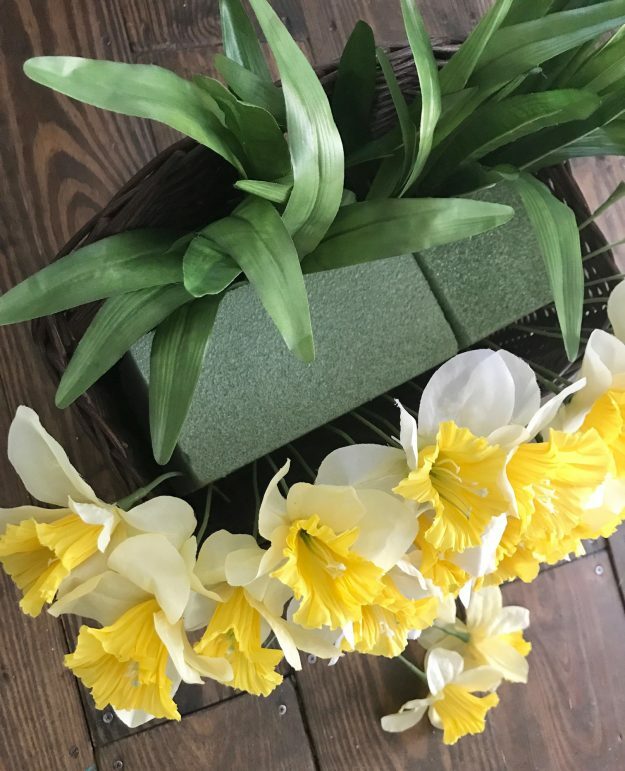 Thanks for sharing my DIY Spring Tulip decor too! This is so pretty! Love the spring wreath. I have had one bicycle basket and never used that this way. I think today is the day! Thanks for the inspiration and direction! Thanks so much Julie and go for it!! So cute, and best of all, so easy! I’ll definitely have to keep my eye out for those daffodils the next time I’m at Walmart.